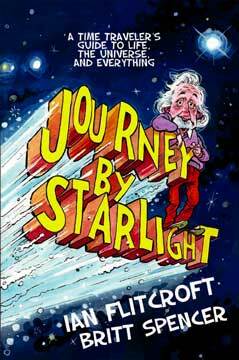 "Journey By Starlight...has the potential to open up physics and the realm of Einstein to unsuspecting comics fans, which means [Dr. Ian] Flitcroft's journey is a success." "Journey By Starlight starts with exactly the point I raised during a meeting at the CERN physics laboratory and communicates an enthusiasm to explore the cosmos with clarity, humor, and surprisingly subtle insights. This book will, I hope, inspire and enthuse a new generation to explore and to think." "You can get more information by reading Albert's journey, than by watching Discovery Channel for 400 years!" "This should be required reading for the first day of every physics, calculus, and chemistry course taught." "Clear and fun, it reminds me of Carl Sagan's Cosmos." "It's kinda amazing how I can read and understand this when I'm in 6th grade." "You bravely tackled difficult topics and concepts in a very clear, easy, and fun-to-read manner. Brilliant!" -Praise for Journey By Starlight from Readers Like You! Albert Einstein said his first ideas about relativity came from looking in the mirror as a teenager and wondering what it would be like to travel on a beam of light. This is the story of that journey. Journey By Starlight follows Albert Einstein and his traveling companion through space and time as they travel on a beam of light from a star 3,200 light-years away to Earth. Along the way, Einstein explains the science behind everything from the origins of the universe to the meaning of life, relativity, black holes, quantum mechanics, climate change, evolution vs. intelligent design, and how the brain works, all delivered in fun, easy-to-understand, bite-sized chunks. Based on the popular blog of the same name, Journey by Starlight has been given the graphic novel treatment, pairing the narrative with fantastic, whimsical artwork. Dr. Ian Flitcroft is a vision scientist and a consultant eye surgeon at the Children's University Hospital, Dublin. As a teenager, he made a close call between choosing medicine or astrophysics as a career, but he hopes this book will encourage a new generation of astrophysicists, scientists, and, perhaps, even a few eye surgeons. Ian studied medicine at Oxford University, where he also completed his doctorate (D.Phil) in visual physiology before going on to complete his medical training at St Mary's Hospital, London. As a writer, he has published more than 30 scientific peer-reviewed papers and chapters in multi-author books. His writing has been featured in Do Polar Bears Get Lonely (New Scientist and Profile Books, 2008), and his first novel, The Reluctant Cannibals, was one of the winners of the Dublin Writers Centre Novel Competition 2012. Journey By Starlight is based on his award-winning popular science blog (www.journeybystarlight.com), which has been viewed more than 700,000 times. Ian lives in Dublin with his wife and three sons. Britt Spencer is an award-winning illustrator with a BFA and MFA from the Savannah College of Art and Design. Since his arrival into the commercial art world, Britt's work has been published internationally and been recognized by the distinguished New York Society of Illustrators and the Society of Illustrators West. He is also the illustrator for several children's books, including Penguin/Philomel Books' Fleas! (2008), Make Your Mark, Franklin Roosevelt (2007), and Zarafa: The Giraffe Who Walked to the King (2009). Britt lives in Savannah, Georgia. You can see more of his work at his website (www.brittspencer.com).